Amy Jo — who has re-opened From a Corner Table, by the way — forwarded a link to Write-a-Go-Go, a site which challenges people to write 36,000 words in 3 months. Welcome to your new challenge. Ready? 36,000 words sounds like a lot, doesn’t it? 144 manuscript pages? But when you break it down to 1,000 words, three times a week, isn’t that something you can do? This got me to wondering: is it something I can do? Is it something I already do? I don’t know. But because I’m a geek, I knew could find out. A little digging turned up a word count plugin for WordPress. I installed it and voila! 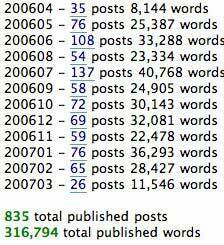 Now I have word count stats at GRS. How much is 50,000 words per month in real-world terms? According to this guide to average manuscript lengths, novels are generally between 25,000 and 150,000 words. A 50,000 word novel would be 200 pages long. I’m writing the equivalent of a 200-page book every month. Now, there are a lot of considerations that go into writing a book that I’m not having to cope with. Short articles are much different than a book-length manuscript. I’m not saying that one is harder or that one is easier — they’re just different. I’m writing a book each month. Yippee! And congrats! I had no idea you are writing so much. Proves that a little bit here and there does go a long way. Hey, hubby! Please take a short break from all that writing and tell me how the cats and my seedlings are doing!